Big and Bold Mandalas is my fourth mini colouring book for all ages. It is a travel size version of the full size Big & Bold Mandalas book, and features easy designs with thick lines and large spaces. The small size of the book makes it perfect for colouring on the go. 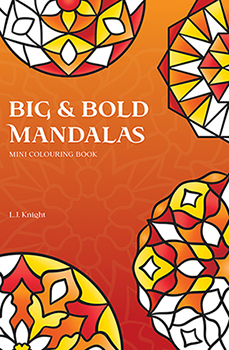 Big & Bold Mandalas Mini is also available from Amazon’s international sites, and other retailers. Below you can see previews of all the images in Big & Bold Mandalas Mini Colouring Book. Just click the thumbnails to enlarge.